IPower Hosting Review: Green, Lean, But Here’s Why We’re Not So Keen. Tomas Gorny founded iPower in 2001. Today the company hosts more than 1,000,000 websites for people in over 100 countries. iPower is a hosting provider with many things going for it. Being eco-friendly, it’s a way you can contribute to a reduction in the carbon footprint you may have if you went with a non-eco-friendly provider. 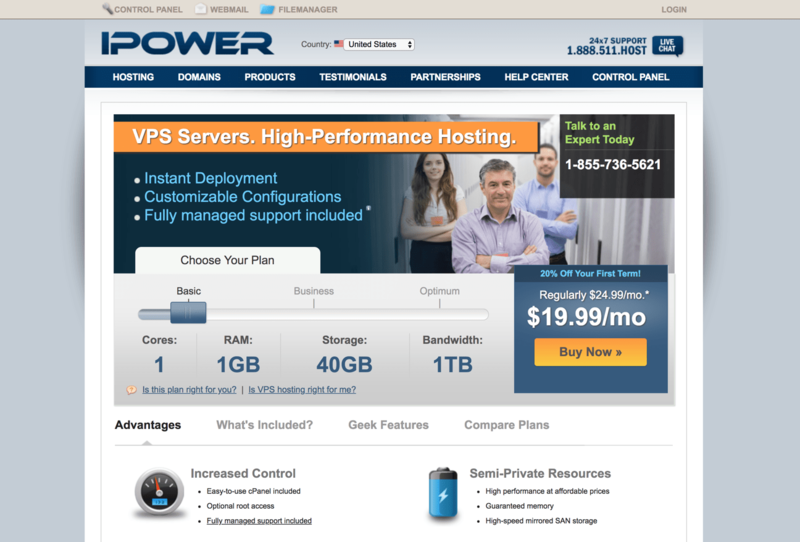 iPower offers cheap web hosting plus the standard web hosting features including a 30-day money-back guarantee. Their cheapest web hosting plan is 3.99 per month. Tomas Gorny founded iPower in 2001. Today the company hosts more than 1,000,000 websites for people in over 100 countries. iPower is one of the many hosting companies that has been bought out by the giant corporation known as the Endurance International Group. iPower is proud to be eco-friendly and is powered 100% by wind energy, an endeavor the company started two years ago. Buying Renewal Energy Certificates (RECs) stops approx. 2660 metric tons of carbon dioxide from finding its way into the atmosphere every year. It’s the same as not driving your car 6.1 million miles or planting 2390 acres of trees. As a website owner with iPower, you can put an eco-friendly logo on your homepage that tells others you’re also proud to be doing your bit for the environment. You may also choose from a collection of 10 eco-friendly WordPress templates to further your appeal in the eyes of your customers. Try iPower. Get started now. Founded by Tomas Gorny in 2001.
iPower offers a range of features geared towards entrepreneurs who are just starting their websites, to e-commerce features for small businesses selling online. Security, regular back-ups and payment gateways are integrated into most packages. When you sign up with iPower you can add a professional business email, which includes filters for spam mail. iPower provides all the tools you’ll need to host your business site – at an affordable price. iPower has flexible packages for shared hosting, VPS and dedicated hosting. There are separate hosting plans for Linux and Windows. All plans come with the basics to ensure you’re delivering a professional online presence. The shared hosting plans all have similar features but they improve as you go up the scale. For example, the Starter Plan has 5 GB of disc space, whereas the others are unlimited. Bandwidth starts at 250 GB and is scalable for the others. The introductory package gets you 5 GB disk space, 250 GB monthly data transfers and one email. A free domain is not included. The mid-range package comes with a free domain, unlimited disk space and the option to add 2 500 email addresses. There’s also no limit to the number of domains you can add, so you can host unlimited sites on a single account. Bandwidth is scalable, meaning you might have to upgrade to a VPS package as your site grows. The highest tier package includes three free domains, unlimited disk space, and unlimited emails. There’s only one Windows-based plan. It has most of the same features as the shared plans but limits are higher in some and others have no limits. You really need to look for yourself to decide if you want a Windows-based plan or a choice of Linux plans. The iPower website has a convenient slider tool to help you select the right plan. If you’re looking for Virtual Private Server hosting, there are three plans to choose from. The VPS packages have offer options with all the bells and whistles without the enormous cost. There’s also optional root access so you can manage your site or you can let the experts at iPower do it for you. There are three dedicated server plans to choose from. If you need total control over your sites, then a dedicated plan is for you. You’ll be hosted on a server with nobody else sharing it. Because you don’t share a server, you’ll have the best speed, performance, and flexibility. You can choose to manage it all yourself or have an expert at iPower do it for you. You get everything that the VPS plans offer and you have no restrictions as to the amount and type of applications you can install. You can run multiple sites with a high level of traffic and e-commerce sites can easily be handled by these plans. WordPress is the most popular CMS, and many web hosts offered tailored WordPress plans. Support for unlimited website visitors. iPower uses the vDeck control panel, from where you can access loads of tools to improve the look and performance of your website. vDeck has an easy to use interface, with useful shortcuts at the top of the page to help you navigate to each section. From your control panel, you can set up customized email accounts like [email protected], install CMS and enable e-commerce options. If you need help, you can find log a support ticket or request instant chat directly from the control panel. Does iPower Offer Reseller Plans? Yes, you can choose from Linux or Windows Reseller plans. These plans are a great way to earn passive income as you can onsell services to your customers and they won’t know you’re just the middleman. Your clients will have their sites hosted on iPower’s unbranded reseller interface program which is called accountsupport.com. These plans have lots of appealing features for your clients. You can brand their sites with your own logos, fonts, and colors. iPower’s engineering team will monitor the networks to make sure your clients have smooth running sites and no issues. Like most web hosts, iPower comes with a choice of website builders to help you easily create you business website. Even if you have little or no web experience, a drag-and-drop site builder lets you easily build a website. Free scripts and site-building scripts are also included. E-commerce services include PayPal, Agora, processing credit/debit cards and online banking. To keep your customer’s financial data safe, there are SSL certificates for secure transactions and extended validation SSL certificates for extra security. You will have access to the amazing Mojo Marketplace with thousands of different apps to help boost your brand and give you a better e-commerce site. Let’s break those 3 categories down and get a sampling of what apps are on offer. Mojo Marketplace is not exclusive to iPower. One-click access to it is offered by many web hosts. If yours doesn’t have access to it you can simply navigate to the Mojo Marketplace yourself and take advantage of all the apps and services. Small business can also integrate Doba, the well-known drop shipping site that enables you to deliver orders, regardless of where the customer lives. Get access to over 1,000,000 products you may sell via your website without the need to store stock, thanks to Doba. iPower offers regular backups and restores, and access to 25 MySQL databases. UPS power backups and daily backups offer extra protection for your site’s content. Try iPower. 30-day money-back guarantee. How is Their Customer and Technical Support? When you’re a small business running your own website, you need access to round the clock tech support when you need it. Assessing a web hosts level of customer service must be an important consideration when you choose a host. iPower has a detailed knowledgebase. But they don’t have an active YouTube channel. 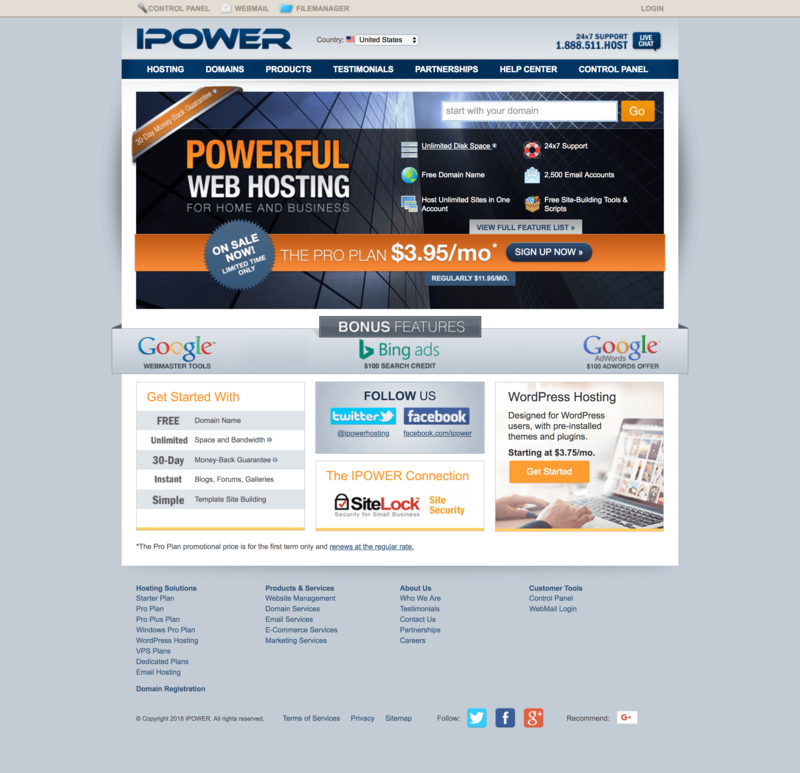 Like most hosting companies, iPower has several options for support. iPower offers a 30-day money-back guarantee. If you’re unhappy with the service and cancel within the first thirty days you get a full refund. Do I Have to Pay for Site Migration? If you’re moving from another web host, iPower offers free site migration. What are the Pros And Cons of iPower Hosting? So, is hosting from iPower any good? Good prices, very cheap web hosting. iPower offers both Linux and Windows-based servers. Easy to use drag-and-drop site builder. Simple to set up an e-commerce site. A lot of different tools, software programs and other benefits you have to see for yourself. Some of the tools need to be paid for in a 12 month upfront payment. Customer support is reported to at times be slow to respond. Difficult to import an existing WordPress site. Below we’ve answered a few common questions about iPower. Feel free to contact us if you have additional questions. How active is iPower on social media? The iPower Twitter account seems a bit sluggish. The last post was made in 2016. The iPower Facebook page started off with enthusiasm but seems to have petered out. The most recent post is from 2015. Those are signs you shouldn’t look to iPower social media to get fast attention to customer service issues or for insightful tips. Use their recommended channels (listed above) instead. What site builder does iPower offer? It’s not clear from the website, but a Google search turns up this iPower page which offers the well-known Weebly site builder. Of course, you don’t have to get an iPower account to build a Weebly site. You can go directly to Weebly and sign up. Learn more about Weebly, and how it compares to competitors, by reading our expert’s review of Weebly. How do I set up iPower G-Suite MX records? Google provides step-by-step instructions on setting up G-Suite MX records here. First, you will follow the instructions to verify your domain ownership. Then you’ll set up your Gmail business email (e.g. [email protected]). You’ll then be directed to use Google’s set up wizard, which keeps the MX process simple. iPower is a hosting provider with many things going for it. Do your homework before committing to anything. Remember, no question is stupid if you don’t know the answer. iPower has a range of web hosting solutions on offer, from shared hosting and VPS hosting to dedicated servers to WordPress hosting. Here below is an overview of their plans and current price list. For latest and most up to date prices visit iPower’s website. We monitor tweets about iPower and apply sentiment analysis to classify tweets as positive or negative. This allows us to output an approval rating score, which is based on real people, positive and negative, opinions about iPower on Twitter. iPower approval rating score is 17%. This is based on a total of 6 tweets that mention iPower on Twitter. There are 1 mentions that share a positive sentiment and 5 mentions that express a negative sentiment. Find out more about how it works. [email protected] Your online customer service reps are slower than watching the grass grow. Where do U find these people? Jesus Christ! @ipowerhosting has been great for hosting but access to email fails often enough looking for another providers. I welcome your suggestions. Is iPower really right for you? It can be hard to say, even with our expert reviews. We recommend going to our sister site WhoIsHostingThis to see what dozens of actual iPower customers have to say about their experiences. Try iPower. 30-day money-back guarantee. Get started now. You are here: Home > Web Hosting: Which Hosting Company Is Best For You & Your Website? > IPower Hosting Review: Green, Lean, But Here’s Why We’re Not So Keen. Previous: LiquidWeb Review: 100% Hosting Uptime But Is It Worth It? Find Out Here. Next: LunarPages Host Review: Does Their Support and Flexibility Meet the Hype?